School is out, summer is here! 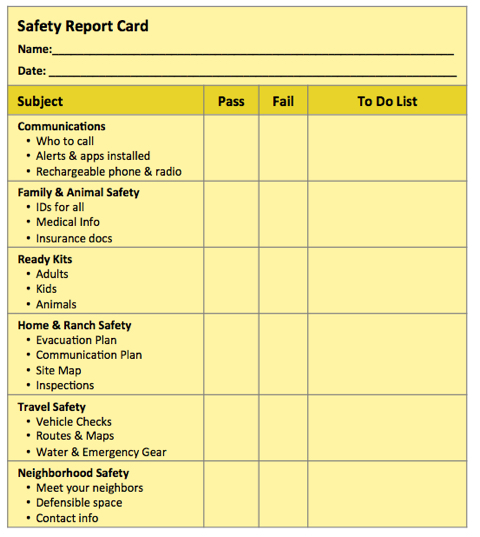 Time to review your Summer Safety Report Card. Here's a "Safety Study Guide" to help you refresh your skills and improve your grades. Review your preparedness. Did you PASS, or FAIL? Visit the resources listed at www.halterfund.org/be-prepared/ to get all the information you need to get a Straight-A Safety Report Card! COMMUNICATIONS: Know how to get alerts & contact loved ones. Always have emergency devices that do not rely on grid power. FAMILY & ANIMAL SAFETY: Make multiple sets of ID, health, and insurance documents, keep in safe, waterproof containers. Have an emergency plan and practice drills. READY KITS: Make kits for every family member. Store in cars and grab-and-go locations. HOME & RANCH SAFETY: Create defensible space, inspect your home, barns, sheds, fire extinguishers, water & power sources, trees. TRAVEL SAFETY: Inspect vehicles, routes & maps, driver awareness, emergency kits. NEIGHBORHOOD SAFETY: Know your neighbors & their contacts. Know vacation rental owner-manager contacts, pet & livestock locations, evacuation routes.